Comm Operator is a professional communication software for Serial Port TCPIP UDP I2C HTTP and FTDI. It will boost the speed to design development debug and test hardware-software applications client-server applications as well as internet applications such as relay boards Electronic Total Station Global Positioning System chemical and medical analysis instruments DMX devices and SMTP protocol etc. Complex structure data can be created like ZigBeeXBee API data framework or GIS Garmin data package. Data can be sent automatically with flexible auto sending rules. Perl Python and Ruby script are supported as well as users EXE and Plug-in dll. 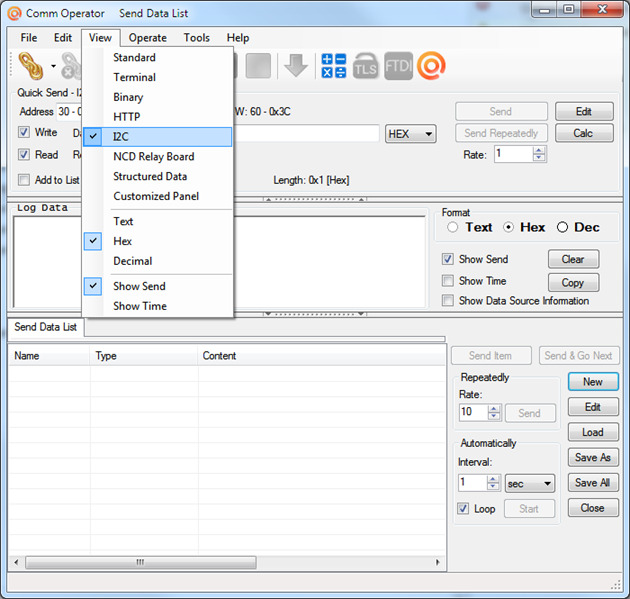 Store data in list and the data list can be created to a COP file which can be opened and tested by our Freeware Comm Operator Pal.  * For system designer Comm Operator will save your time and money to build prototype. The protocol design can be done with Comm Operator only. 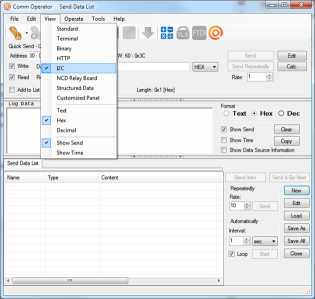 The content in send data list can be used as test data for later development..* For software programmer and hardware engineer Comm Operator can simulate the software and hardware. The system can be developed parallel and find out the problem easily. * For engineers who test and deploy the system Comm Operator is the right tool for unit test. It can be setup as environment for parts before put the system online. * For support work Comm Operator can create COP file and help customers to fix problem in communication layer easily.